For some reason, as soon as I graduated high school, I decided it was time to mark my newfound freedom as a college student living on my own in a different city by becoming an avid concert-goer. Also, I really needed to experience live music beyond just the 2 NSYNC concerts I went to as a kid. Lucky for me, Boston is not only a major city stop on a lot of great bands’ tours, but also boasts a ton of cool concert venues. And I’m not talking about going to TD Banknorth Garden or Bank of America Pavillion. In fact, the only time I’ve been to a concert in a huge venue in Boston was at Fenway Park, which personally I thought was more exciting to watch than a baseball game. Thanks to my reliable “New England Concert Update” emails from Live Nation and Ticketmaster, I’ve been able to see some of my favorite musicians and artists at a range of different venues (as well as reminders of what shows I’m too broke to afford at the time). Each location makes the live music experience unique from the others and my recommendation for BU students is to try them all and see for yourselves. And another plus to going to concerts in smaller venues is that most of the time, you don’t have to break the bank for a couple tickets because the prices are usually significantly less than you’d pay to see a performance at a place like TD Banknorth. So here’s my list of some of the best places to see a concert in Boston, including both new and old establishments, as well as some that are too close to campus to not check out. Most of these venues don’t have assigned seating, so go early if you want to snag a spot near the stage. 1. Paradise Rock Club – Located right near the CityCo in West Campus, this historic venue has been around since the great rock ‘n roll days of the 70’s and was the first U.S. venue that U2 performed in. Aside from hosting music icons like The Police, Tom Petty and the Heartbreakers, Elvis Costello, and Billy Joel back then, in recent years they’ve had Kings of Leon, Of Montreal (which was an epic visual acid trip when they performed on Marathon Monday in 2009), and Bruno Mars. This is one of my favorite concert venues of all the places I’ve been to in and outside Boston because its smaller size allows performers and the audience to have a more intimate experience with live music. Take it from someone who saw a Bruce Springsteen cover band TWICE here (that’s soccer mom status right there), as well as Blitzen Trapper and Of Montreal Marathon Monday madness. 2. 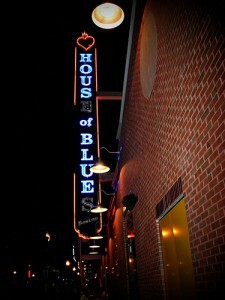 House of Blues – One of the newer venues in Boston with locations all over the U.S., HOB is right next to Fenway Park down on Landsdowne St. When I first went to see Matt and Kim here last fall, it immediately reminded me of a place called Koko that I went to in London during my semester abroad. Both have big theatre-like stages and a higher level in addition to the main floor for people to watch the band perform from. BU chose HOB for the Scarlet Fever concert featuring Big Boi and Vonnegut this year and seniors will also get a chance to go to HOB during senior week events. The trainwreck that is Ke$ha recently performed here the other night and upcoming shows include Iron & Wine, Diddy Dirty Money, and Guster. 3. 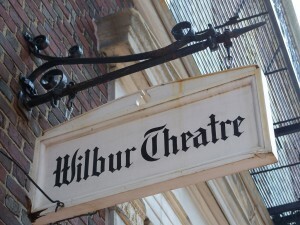 Wilbur Theatre – This venue located on Tremont St. in Boston’s theatre district became the new home to the Comedy Connection, which used to be located inside Quincy Market right before I came to BU in 2007. While they mostly host wickedly hilarious comedians (including Louis C.K., Aziz Ansari, Doug Benson, and Kathy Griffin), Wilbur also books some well-known (and random) musical groups, including Frankie Valli & the Four Seasons and Boyz II Men (I assure you this is their 2011 concert calendar I’m referencing). I first saw The Fray here during my sophomore year, which was probably the perfect venue for their music. The stage design was full of all different size and shaped lamps that were mostly kept dim, which added to the historic old-theatre vibe during the performance. An awesome place to check out live music as well as stand-up. 4. The Middle East – For the live music fanatic who doesn’t mind venturing further off campus to Cambridge, this is definitely a spot to check out. The Middle East has several sections to it, including a huge downstairs area where big shows take place and a couple lounge sections where you can catch some live jazz music or even some stand-up comedy. It used to be a place mostly known for booking good indie rock lineups, but more recently it has become a haven for electronica gigs with DJ sets and their biddie-filled Throwed dance party nights. There’s also a restaurant and bar area to hang out in before or after shows. 6. Brighton Music Hall – Formerly Harper’s Ferry, the people who own Paradise Rock Club recently took over this venue, which is located on Brighton Ave. in Allston. While one of the smallest of these venues listed, tickets for shows generally cost only between $10 and $15. A lot of the bands that come through here may not be as recognizable as performers at Paradise or House of Blues, but there’s still a lot of good live music listening to be experienced in this music hall with a dive bar-feel. And once in a blue moon, they’ll even have a night of comedy, including a past performance by 2/3rd of comedy trio Stella – Michael Showalter and Michael Ian Black. I’m still kicking myself for not getting tickets to that show. graduated FROM high school, not “graduated high school.” AHH!